“On April 19, Scarborough Arts presents the Healthy Arts for Seniors (HAFS) Exhibition Opening Reception and Anthology Launch, showcasing photography, poetry, fiction and non-fiction prose, and audio recordings created by 18 Scarborough seniors as part of the HAFS program. Exploring themes of family, immigration, aging, triumphs and sorrows, and love and loss the exhibition and anthology illuminates the hidden worlds of some of Scarborough’s most talented elders, depicting the diversity of their experiences as told against the diverse and multicultural backdrop of our beloved Scarborough. 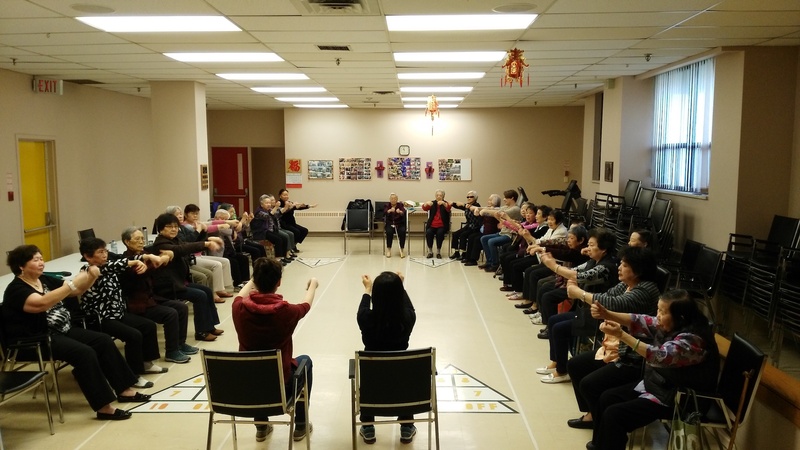 The Healthy Arts for Seniors program was developed by Scarborough Arts in an effort to break patterns of isolation amongst seniors and provide an opportunity to explore what it means to build healthy lives through the arts in an inclusive and welcoming environment. The program, which ran from October 2017 to April 2018, engaged 25 seniors as it travelled to East Scarborough Storefront in South Scarborough and then to Agincourt Community Services Association in North Scarborough. Participants met weekly and learned about the creative and technical aspects of photography, creative writing, and oral storytelling. The Healthy Arts for Seniors Exhibition Opening Reception and Anthology Launch will take place on Thursday, April 19, 2018, from 2:00 PM to 4:00 PM at Scarborough Arts’ Bluffs Gallery on 1859 Kingston Road. The afternoon will feature live readings by seniors, food and refreshments, and an opportunity to mix and mingle while viewing the exhibit. The Healthy Arts for Seniors exhibit runs from April 5 to 27, 2018. It is curated by Diana Nazareth, HAFS Program Facilitator and Coordinator. For more information about Scarborough Arts’ Healthy Arts for Seniors program, visit www.scarborougharts.com/HAFS-2018. 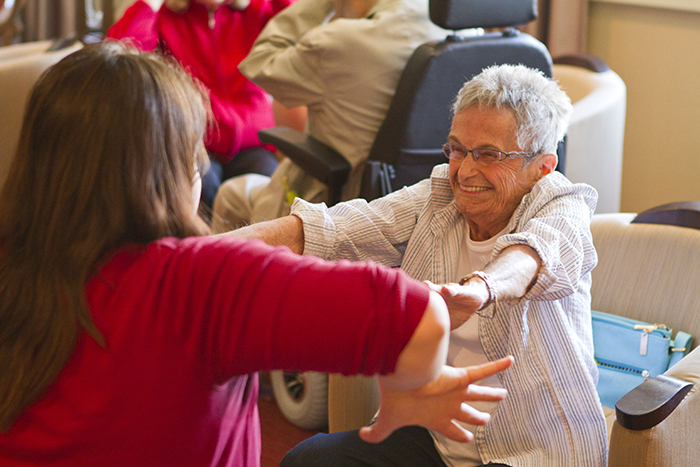 The Healthy Arts for Seniors program was made possible through the support of the City of Toronto, the Ontario Arts Council, and the Ontario’s Seniors’ Secretariat. We also acknowledge the support of our program partners: East Scarborough Storefront and the Agincourt Community Services Association. 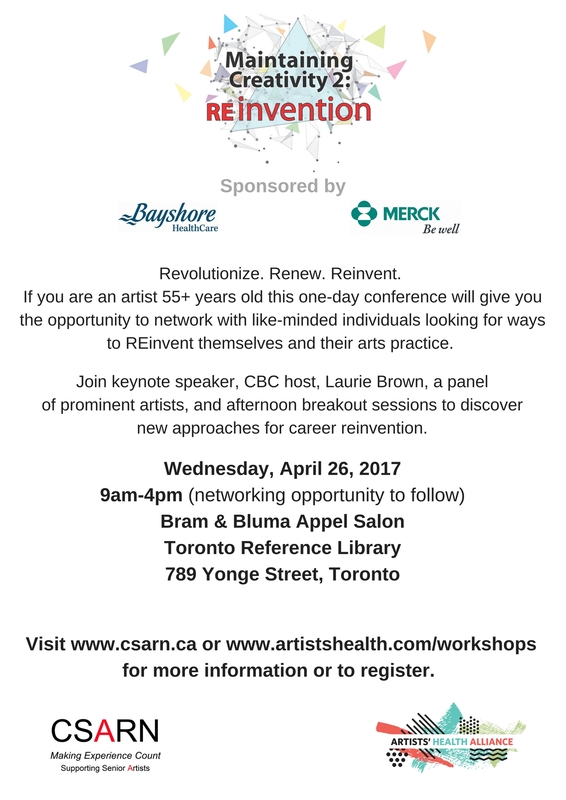 “Following our sold out inaugural conference in 2016, the Artists’ Health Alliance and the Canadian Senior Artist Resource Network (CSARN) are thrilled to present Maintaining Creativity 2: REinvention, on April 26, 2017 at the Bram & Bluma Appel Salon, Toronto Reference Library. The theme of this full-day conference for senior artists is REinvention. That will be the topic of our keynote address by CBC host Laurie Brown, and a morning round-table discussion led by a panel of prominent artists. For more information, please visit Artists’ Health Alliance website. Click through the Resource Portal to access the document. “Join us this October for our NEW Training Program and learn the intergenerational and community-based theatre techniques used by the GeriActors. This program is perfect for actors, educators, healthcare providers, recreation professionals, and more! *This fee will be offset by the payment participants will receive for leading a workshop. At the end of the Training Program those interested will have the opportunity to lead, in pairs, a workshop in Performance Storytelling, for which they will be paid. This 3-week Residency is a great opportunity to put into practice what you learned in the training program. Gus obtained his PhD from the University of Victoria. His research focused upon the creation of an Intergenerational Theatre performance in rural Tamil Nadu, India. As a theatre artist, he has mainly focused on helping marginalized communities create theatre based upon the community’s stories. He has worked with seniors, inmates in prisons, various groups of Canada’s Indigenous populations, young people, GLBT communities, and religious groups. In Victoria, he was the Director/Playwright for the Living History – Reminiscence Theatre Company, and from 2005-2010 he was the Assistant Director of the GeriActors. 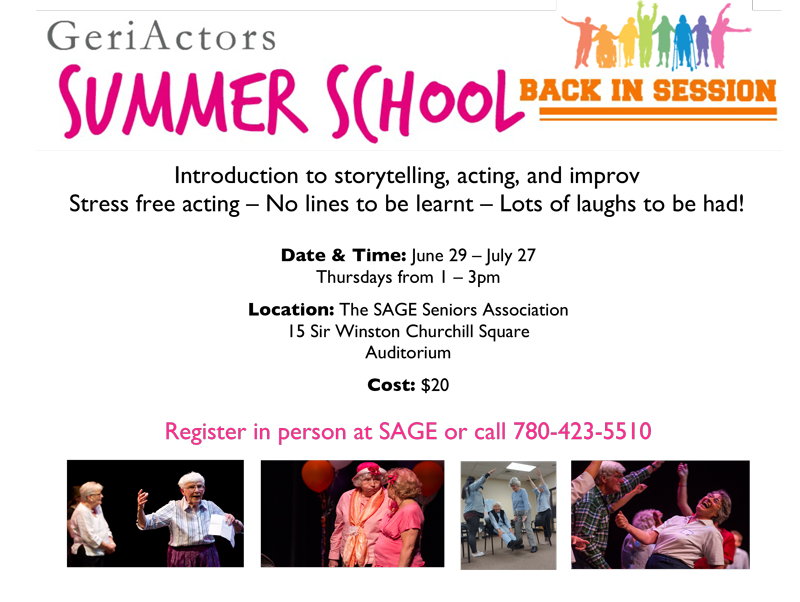 “GeriActors is running a new Training Program in our intergenerational theatre techniques for actors, educators, healthcare providers, and recreation professionals. At the end of this Training Program, trainees will apply what they learned by leading workshops for seniors in Performance Storytelling. 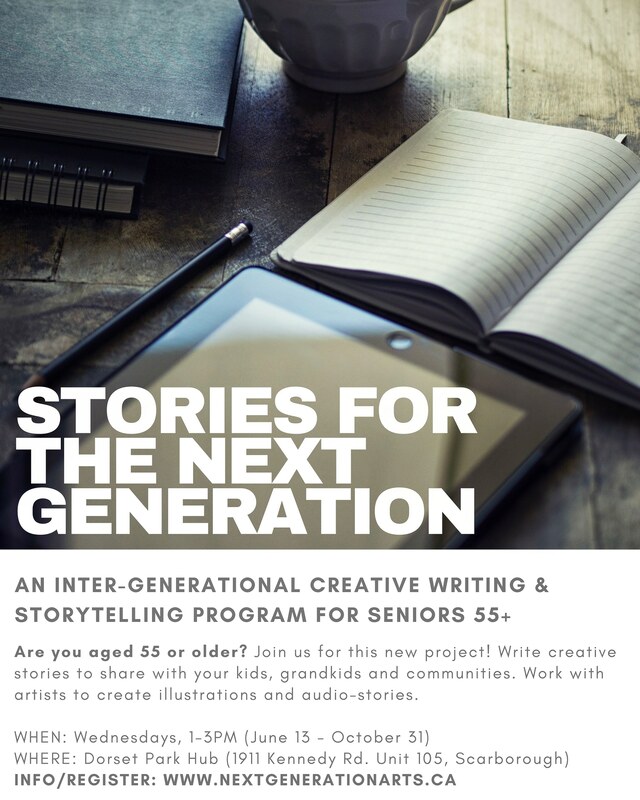 We are inviting seniors’ venues and organizations to host Performance Storytelling workshops over a period of three weeks, November to December. Minimal cost to hosts! Hosts will be responsible for providing workshop space, administrative support and assistance with publicity. Workshops will be open to all seniors without restriction, with no experience required, and with all levels of mobility welcomed. 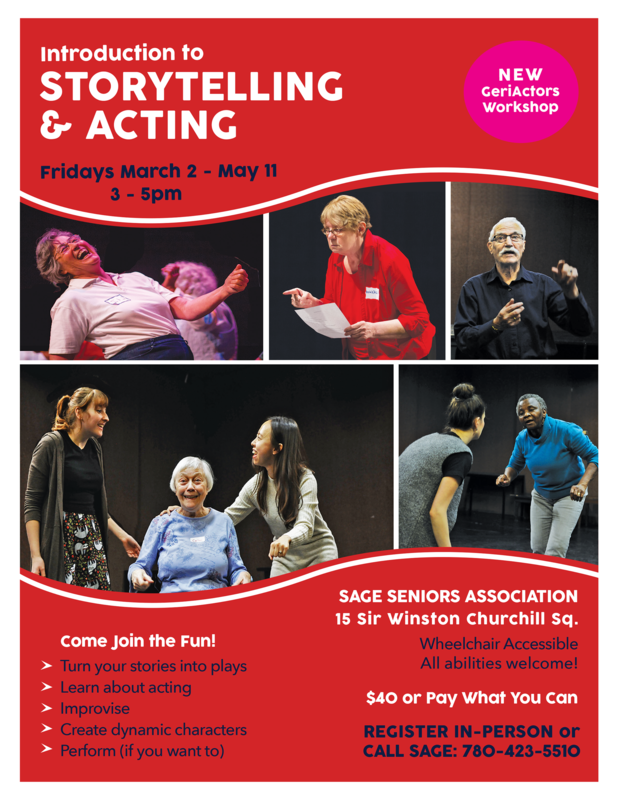 Performance Storytelling – Using theatre exercises, improv, laughter and fun GeriActors inspires reminiscences, and helps participants turn their stories into moments of theatre to share with others. Whether you have a history in theatre, have always dreamt of performing, or just want to try something new a GeriActors workshop is the perfect place to begin. Interested organizations should contact Becca Barrington at geriactors.friends@gmail.com for an application. Completed applications are due September 25.